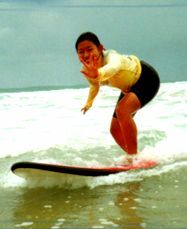 East Coast Surf School was established in 1992 by Helene Enevoldson after she completed her Human Movement Science Degree. Helene Has surfed since the age of five and has competed since the age of 13. She ranked 17th as a professional surfer on the World Championship Tour. over 25 years later, remains one of the cutting edge surf schools in the world. 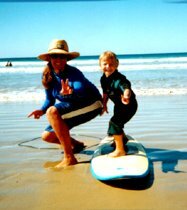 East Coast Surf School has been featured on CNN, 5 international and over 18 Australian Television broadcasts. Coffs Harbour experiences lovely summers and mild winters. The water rarely drops below 18°C/60°F in Winter!!!! Warmer than most northern Hemisphere summers! We often surf with dolphins and between June and August, the Whales swim by on their breeding route. Our National Parks and Solitary Marine Park offer beautiful sights with great walks, fishing, diving and boating. A great place to visit. Our aim is to provide surfing programs that maximise performance enhancement to people of all ages, cultures and backgrounds while providing and ensuring a safe and fun learning environment. At East Coast Surf School we provided the highest quality equipment at no extra or hidden cost to our customers. Form your own group and book in for a lesson, course or camp. We can tailor design a program to suit your needs. at East Coast Surf School.